At age three, our son Kurt was diagnosed with Limb-girdle muscular dystrophy type 2C (LGMD2C). Then we learned that our younger son, Peter, has it too. We were told that there’s no treatment, no cure, and virtually no research. We were also told that few kids with LGMD2C live beyond their twenties. When we got this news, we felt like our world was coming to an end. We realized that we would have to be the ones to push the research forward. We started the Kurt+Peter Foundation to fund the search for a cure. Scott found a scientist named Beth McNally who has spent more time studying this disease than anyone else. She was willing to test a genetic therapy. We raised the funds for her experiment, and it worked. It’s not a cure, but it suggests that a treatment will be possible. The foundation is key to our family’s resilience. It gives us realistic hope. And it’s important to the kids’ resilience to know that we’re working hard to find a treatment for them. With zero staff, we’ve raised money and made grants of over $1 million. A few months ago, a woman from Indiana wrote to us. Her little girl was diagnosed with the same type of muscular dystrophy as our boys. We helped her to feel less alone, and that felt wonderful. Daily resilience can be challenging. People sometimes make hurtful comments to the boys. We try to give them the skills to stand up for themselves in a productive way. Kurt recently had an adult say something unkind, and he simply said, “That was hurtful.” Kurt is only eleven. He and Peter are an inspiration to us. When they talk about their condition with their friends, other kids sometimes ask scary questions. They’ve been asked, “Are you going to die?” So we talk about those things in a way that makes sense to them. We tell them that we’re all going to die, but we don’t expect anyone in the family to go anytime soon. Having two kids with muscular dystrophy has changed how we view the future. We seize every chance to enjoy the time we have. We travel as much as possible. We spend hours reading aloud every day. We maximize our family time. We feel so grateful for every moment with our sons. We’re very positive people, and we try to instill that quality in our kids, too. We tell them that, yes, muscular dystrophy stinks. But we have to live the life we’ve got. We’re going to live it as best we can, enjoy each moment, and try to leave the world a better place than we found it. 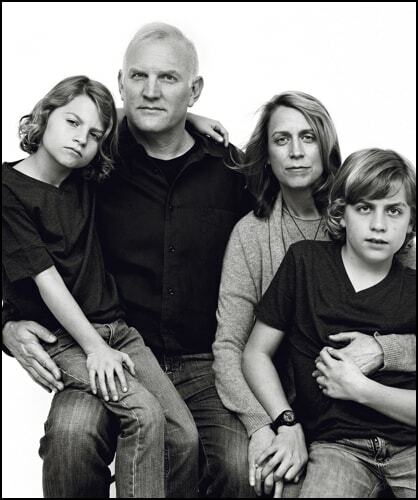 Char and Scott are the parents of Kurt and Peter, two boys diagnosed with a rare, serious form of muscular dystrophy. They founded the Kurt+Peter Foundation that funds research for a treatment for the disease. Char is a pediatrician and Scott is an attorney.